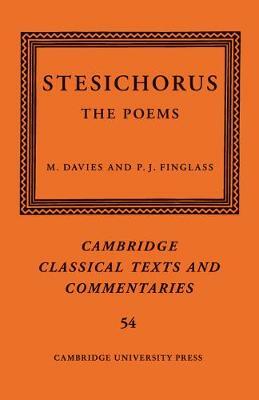 Author(s) Stesichorus; Davies, M.; Finglass, P. J.
Stesichorus' lyric poetry vividly recreates the most dramatic episodes of Greek myth: the labours of Heracles, the sack of Troy, the vengeance of Orestes, and more besides. It can be appreciated today as never before, thanks to the recent discovery of ancient manuscripts buried for some two millennia in the sands of Egypt. This fresh edition of Stesichorus' poems presents the first full-scale analysis of all his surviving works. The detailed introduction and commentary investigate a wide range of key issues, such as Stesichorus' imagery and style, his narrative technique, and his mythological innovations. The controversial question of how Stesichorus' poems were originally performed receives careful scrutiny; particular attention is paid to the fascinating story of the transmission, disappearance, and recovery of his work. A translation integrated with the commentary renders this book accessible to all readers with an interest in early Greek poetry and its legacy.